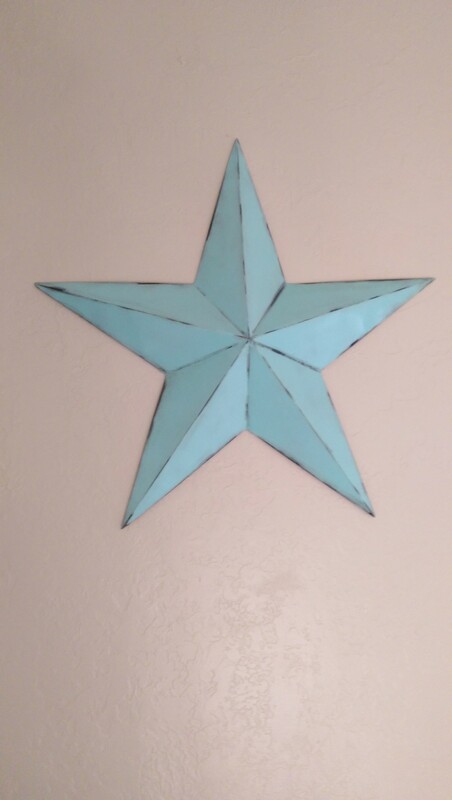 Love the star, but what I really want to know is the shade of gray you are using on your walls! What paint store, and what is the name of the color of gray? I brought home gray paint swatches from Lowes, and they are all too blue! I do want a slight hint of blue, but not a grayish bluish color! Thanks! So far I have painted the family room, dining room and halls Sherwin Williams “Repose Gray” in a satin finish. Stop by my house the next time you are on town. You can also Google “images” with the paint color name. I’ll add pics to my blog soon. Love the star! I’ve been wanting some for awhile and never come across them. And for only $1!!?!? Lucky you! 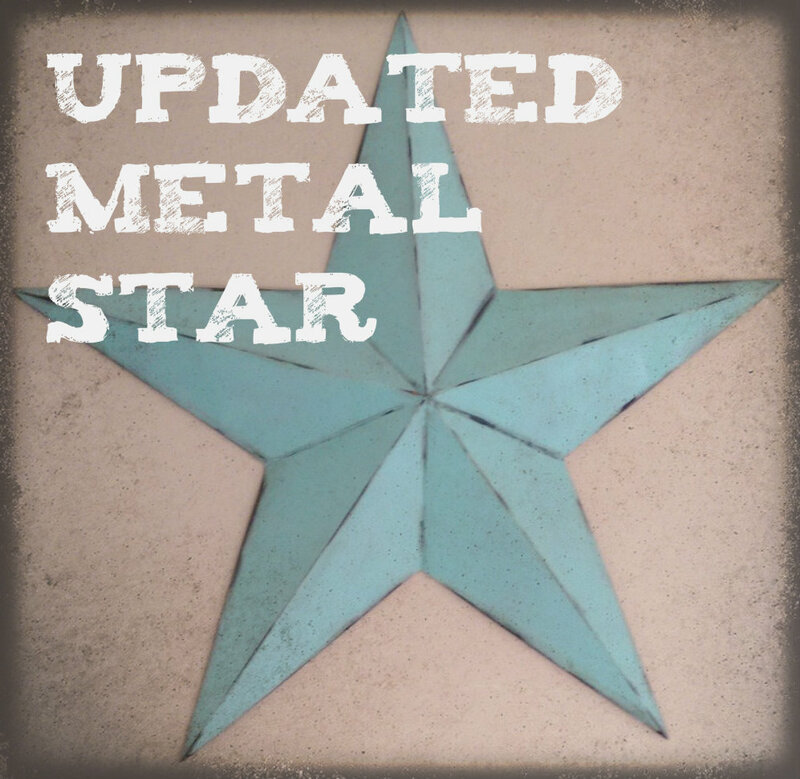 I have always loved these metal stars. Pure luck! Thanks for stopping by! Like the finished product the color and the shady looks so contemporary. Good tip about wearing gloves to to do this clever project. Thanks, Inez! I always end up with messy hands. I should know better by now! This is so pretty. 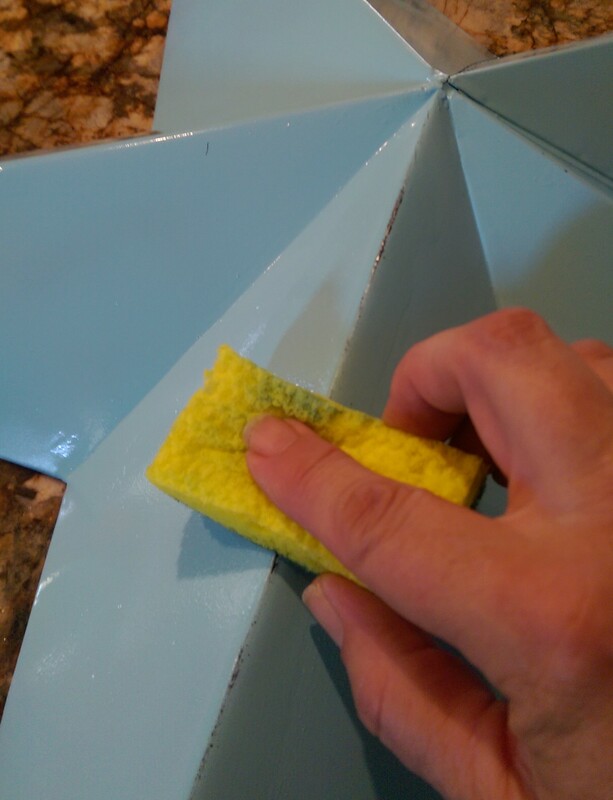 I love that teal, that would work great in a vintage kitchen with that aqua color. Thanks for posting. Hello from Frugal Family. Why, thank you! And, thanks for hosting the link party! I’m a sucker for any and every shade of turquoise. LOVE the new hue you picked! 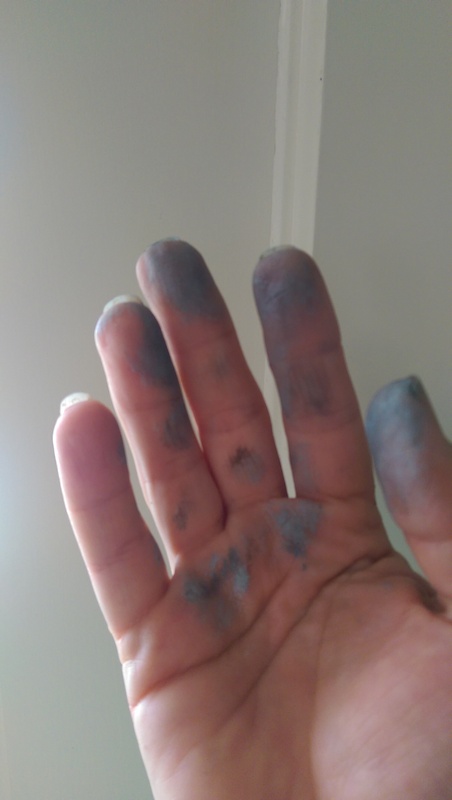 My hands look similar, too, after a painting project. I always tell myself that I’ll be careful…ah, the best of intentions, right? Thanks! I love the color as well, and the fact that it comes in a spray paint…even better! Love that blue! I have been on a spray paint DIY kick lately too! Love it!! Found you at the This is How We Roll Link Party! Spray paint is just so fast and simple to use. Thanks so much for stopping by! This turned out great! Reminds me of one time I distressed a whole cabinet with fingernail polish and some cotton rounds. I just grabbed what I had at the time. Fingernail polish… That is awesome! They say that necessity is the mother of invention. Thanks for stopping by! 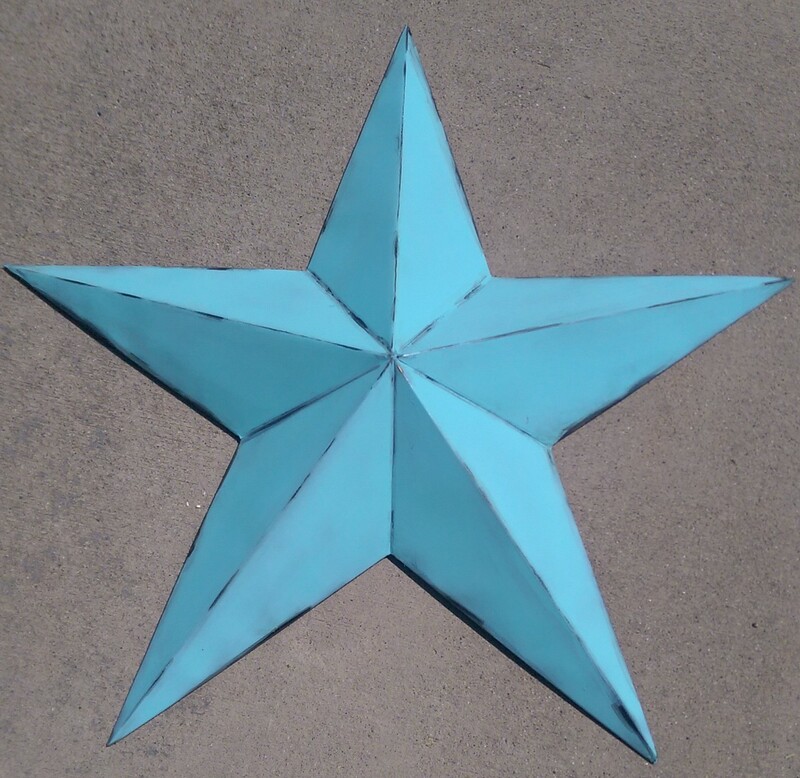 I have one of these stars too, but it is a nice galvanized silver! it goes just about anywhere I put it! I will save your tip though, for when I find something else that needs a paint job! Galvanized silver… nice. I wouldn’t touch it either. Thanks for stopping by! Thanks, Lorelai! I love visiting your party each week. Thanks for hosting! Why thanks so much! I appreciate you stopping by! It looks way better now! Thanks for sharing this to the Bloggers brags pinterest party! Pinned! I don’t know what I would do without spray paint. Thanks! Thanks! You can bet that I will! I love your phrase, “…has worked a treat”. How sweet! Thanks so much! Love the star! 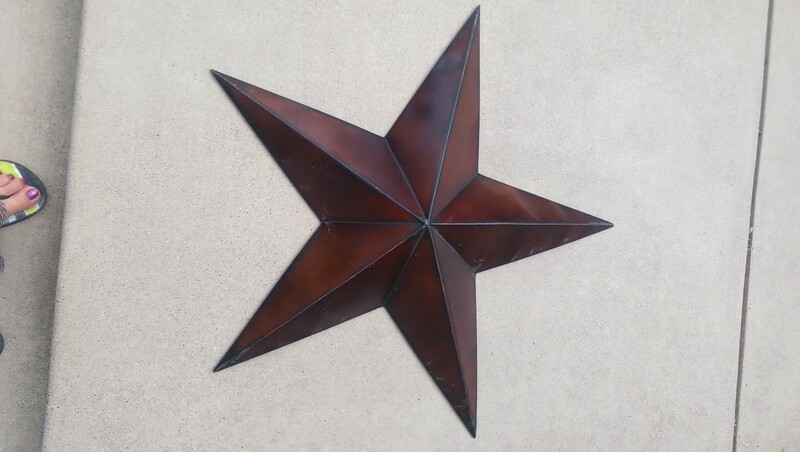 We forgot our star that we had on the front/outside of our Palo Cedro home. Maybe some of my friends could dress up in black cat burglar outfits and sneak over there during the dark of night while humming the Pink Panther theme and nab it. That would be a fun adventure to tell about at dinner parties…It would hang on our home in Granite Bay, as a testimonial of the nuts I miss in Palo Cedro. ……Hmmm. Just puttin it out there…. Let me know when you go to Sac. Temple next. I will meet you there. Patrice, you crack me up! Not sure I could pull off the whole thievery thing, sorry! Yes, we need to get to Sac. soon. Ican’t wait to go to Sharilee’s Dream Palace! Girls Camp next week. Miss you!